This chemistry dictionary offers the chemistry definitions starting with the letter M. These glossary terms are commonly used in chemistry and chemical engineering. Click the letter below to find the terms and definitions beginning with that letter. macromolecular – A macromolecular structure is a structure in which all of the atoms within a crystal are linked together by chemical bonds. Example: Silicon is macromolecular since all of the atoms in a silicon crystal are chemically bonded into a single unit. macromolecule – A macromolecule is a molecule with a very large number of atoms. Macromolecules typically have more than 100 component atoms. Example: Most polymers are macromolecules and many biochemical molecules are macromolecules, such as proteins, DNA, and RNA. Madelung’s rule or Klechkowski’s rule originally was described by Charles Janet in 1929 and rediscovered by Erwin Madelung in 1936. V.M. Klechkowski described the theoretical explanation of Madelung’s rule. The modern Aufbau principle is based on Madelung’s rule. magnesium – Magnesium is the name for the alkaline earth element with atomic number 12 and is represented by the symbol Mg.
magnetic quantum number – The magnetic quantum number, mℓ, is the quantum number that identifies different orbitals within a subshell. mℓ can take on values from -l to +l. The number of orbitals within a subshell is the number of possible magnetic quantum number values. main group – A main group is any of the numbered groups within the Periodic Table. Example: Group 1, the alkali metals, is a main group. main group elements – The main group elements are any of the chemical elements belonging to the s and p blocks of the periodic table. malleable – Malleable is the term for a substance capable of being shaped. The term is often used with reference to metals, as in the degree to which they can be shaped by pounding with a hammer. manganese – Manganese is the name for the transition element with atomic number 25 and is represented by the symbol Mn. manometer – A manometer is a scientific instrument used to measure gas pressures. Open manometers measure gas pressure relative to atmospheric pressure. A mercury or oil manometer measures gas pressure as the height of a fluid column of mercury or oil that the gas sample supports. Markovnikov addition – Markovnikov addition is an addition reaction between an electrophile compound HX and either an alkene or alkyne where the hydrogen atom of HX bonds to the carbon atom with the most hydrogen atoms in the initial alkene double bond or alkyne triple bond and the X bonds to the other carbon atom. Markovnikov’s Rule – Markovnikov’s rule is an addition reaction between a protic acid, HX (X is a halogen atom) and either an alkene or alkyne where the hydrogen atom of HX bonds to the carbon atom with the most hydrogen atoms in the initial alkene double bond or alkyne triple bond and the X bonds to the other carbon atom. Note: Markovnikov’s Rule applies to a specific type of Markovnikov addition reaction. The two terms are not generally interchangeable. mass – Mass is the property which reflects the quantity of matter within a sample. Mass is reported in grams and kilograms. mass defect – Mass defect refers to the difference in mass between of an atom and the sum of the masses of the protons, neutrons, and electrons of the atom. This mass is typically associated with the binding energy between nucleons. mass excess – Mass excess refers to the difference between the experimentally observed mass of an atomic nucleus and the sum of the total number of protons and neutrons or mass number of the atom. mass number – An integer equal to the sum of the number of protons and neutrons in an atomic nucleus. Example: 37Cl17 has a mass number of 37. Its nucleus contains 17 protons and 20 neutrons. mass percentage – Mass percentage is one way of representing the concentration of an element in a compound or a component in a mixture. Mass percentage is calculated as the mass of a component divided by the total mass of the mixture, multiplied by 100%. Example: Ordinary bleach is 5.25% NaOCl by mass, which means each 100 g of bleach contains 5.25 g NaOCl. mass specific heat capacity – Mass specific heat capacity is the amount of heat energy required to raise the temperature of a body per unit of mass. In SI units, mass specific heat capacity (symbol: c) is the amount of heat in joules required to raise 1 gram of a substance 1 Kelvin. Examples: Water has a mass specific heat capacity of 4.18 J. Copper has a mass specific heat capacity of 0.39 J.
mass spectrometer – A mass spectrometer is a scientific instrument used to measure the masses and relative abundances of a vaporized and ionized sample. mass spectroscopy – Mass Spectroscopy is an analytical laboratory technique to separate the components of a sample by their mass. The sample is vaporized into a gas and then ionized. The ions are then accelerated through a potential difference and focused into a beam. The ion beam passes through a magnetic field which bends the charged stream. Lighter components or components with more ionic charge will deflect in the field more than heavier or less charged components. A detector counts the number of ions at different deflections and the data can be plotted as a ‘spectrum’ of different masses. matter – There are many possible definitions for matter. Matter is the term for any type of material. Matter is anything that has mass and takes up space. The word is sometimes used to refer to a pure substance. Maxwellian distribution – Maxwellian distribution is a relation which describes the way molecular energies, as indicated by their speeds, are shared between the individual molecules of a gas. measurement – Measurement is collection of quantitative data. A measurement is made by comparing a quantity with a standard unit. Since this comparison cannot be perfect, measurements inherently include error. mechanism – Mechanism refers to the sequence of steps which occur during a chemical reaction. medicinal chemistry – Medicinal chemistry is the chemistry discipline concerned with the design, development, and synthesis of pharmaceutical drugs. The discipline combines expertise from chemistry and pharmacology to identify, develop and synthesize chemical agents that have a therapeutic use and to evaluate the properties of existing drugs. Mega – Mega is the prefix associated with x106 and is denoted by the symbol M.
Example: The circumference of the Earth at the equator is approximately 40 Megameters or 40,000,000 meters. meitnerium – Meitnerium is the name for the transition metal element with atomic number 109 and is represented by the symbol Mt. melting – Melting is the process by which a substance changes from the solid phase to the liquid phase. Example: Melting of a solid ice cube into liquid water. melting point – The temperature at which a solid and liquid phase may coexist in equilibrium. The term applies to pure liquids and solutions. Melting point is often abbreviated to m.p. mendelevium – Mendelevium is the name for the actinide element with atomic number 101 and is represented by the symbol Md. meniscus – A meniscus is phase boundary that has been curved because of surface tension. Example: A meniscus is seen between the air and water in a glass of water. The water is seen to curve up the edge of the glass. mer – A mer is a group of atoms that constitute a polymer chain repeating unit. mercaptan – Mercaptan is an organic sulfur compound composed of an alkyl or aryl group and a thiol group. General formula: R-SH where R is an alkyl or aryl group. Example: The amino acid cysteine is a mercaptan. mercury – Mercury is the name of the transition metal element with atomic number 80 and is represented by the symbol Hg. meso – Meso- is a prefix used in organic chemistry nomenclature to identify substituents occupying a benzylic position, with the first carbon covalently bonded adjacent to an aromatic ring. mesomerism – Mesomerism is a method of describing the delocalized electrons in some molecules where the bonding cannot be explicitly expressed by a single Lewis structure. Each individual Lewis structure is called a contributing structure of the target molecule or ion. Contributing structures are not isomers of the target molecule or ion since they only differ by the position of delocalized electrons. met – Met is an abbreviation for the amino acid methionine. Methionine is also abbreviated as M.
meta – Meta is a prefix used to describe a molecule where substituents are at the 1 and 3 positions on an aromatic compound. The symbol for meta is m-. Meta can also be used to describe a dehydrated form of an acid or salt. metabolism – Metabolism is the set of biochemical reactions involved in storing fuel molecules and converting fuel molecules into energy. Metabolism may also refer to the sequence of biochemical reactions compounds undergo inside a living cell. Metabolism or metabolic reactions include anabolic reactions and catabolic reactions. metabolite – A metabolite is any chemical compound produced as a result of metabolism or a metabolic reaction. Example: Glucose is one of the metabolites of starch metabolism. metal – A substance with high electrical conductivity, luster, and malleability, which readily loses electrons to form positive ions (cations). Metals are otherwise defined according to their position on the Periodic Table, including groupings as alkali metals, alkaline earth metals, transition metals, and rare earth metals. metal complex – A metal complex is a chemical species consisting of a central atom or ion bonded to surrounding molecules or ions. The central atom of a coordination complex commonly is a metal cation. Various ligands or complexing agents may surround the central atom of a coordination complex. Examples: hemoglobin and Prussian blue are metal complex compounds. metallic character – Metallic character describes the set of chemical properties that are associated with the elements classified as metals in the periodic table. Metallic character depends on the ability of an element to lose its outer valence electrons. metallic compound – A metallic compound is a compound that contains one or more metal elements. Example: Silver nitrate (AgNO3) is a metallic compound. metalloid – A metalloid is an element with properties intermediate between those of a metal and nonmetal. Metalloids may also be defined according to their location on the Periodic Table. Examples: silicon and boron are metalloid elements. metallurgy – Metallurgy is the science of extracting metals from their ores. Also used to refer to the science of working metals. metastable – Metastable refers to an energy state where the system is in equilibrium at a higher than the ground state. Metastable states drop to a lower energy state with outside interactions. meter – Meter has several meanings in chemistry. The meter is the basic unit of length in the SI system of units. The meter is defined to be the distance light travels through a vacuum in exactly 1/299792458 seconds. 1 m is about 39.37 inches. Meters are abbreviated using a lower case “m” in measurements. A meter is any device which measures and records the quantity of a substance. A meter is any device which measures and may record an electrical or magnetic quantity, such as voltage or current. methyl – Methyl is a functional group derived from methane-containing one carbon atom bonded to three hydrogen atoms, -CH3. methylene group – A methylene group is a hydrocarbon group of atoms with the composition -CH2-. Example: Propane has the structure CH3-CH2-CH3. The central carbon is part of a methylene group. micro – Micro is the prefix associated with x10-6 and is denoted by the symbol μ. Example: The width of a typical human hair is on the order of 50 μm or 0.000005 meters. microbicide – Microbicide is a compound that damages or destroys microbial organisms. microgram – A microgram is a unit of mass equal to 1/1,000,000th of a gram or 1/1,000,000,000th of a kilogram. The symbol for microgram is μg. 1 μg = 10-6 g = 10-9 kg. microliter – A microliter is a unit of volume equal to 1/1,000,000th of a liter. The symbol for microliter is μl or μL. micrometer – A micrometer is a unit of length equal to 1/1,000,000th of a meter. The symbol for micrometer is μm. 1 μm = 10-6 m.
Example: Red blood cells are approximately 10 micrometers in diameter. micron – Micron is a shortened name for micrometer. See micrometer definition above. microwave – Microwaves are part of the electromagnetic spectrum of light corresponding to frequencies between 300 MHz and 300 GHz or wavelengths between 3 mm and 30 cm. milli – Milli is the prefix associated with x10-3 and is denoted by the symbol m.
Example: A teaspoon can hold 5 milliliters of liquid. milligram – A milligram is a unit of mass equal to 1/1000th of a gram or 1/1,000,000th of a kilogram. The symbol for milligram is mg.
milliliter – A milliliter or millilitre is a unit of volume equal to 1/1000th of a liter. The symbol for milliliter is either ml or mL. millimeter – A millimeter or millimetre is a unit of length equal to 1/1000th of a meter. The symbol for millimeter is mm. 1 mm = 10-3 m.
millimeters of mercury – Millimeters of mercury is a unit of pressure. A millimeter of mercury is the amount of pressure required to raise the column of mercury one millimeter in a mercury manometer. Example: Blood pressure is typically measured in millimeters of mercury. mineral – A mineral is a naturally occurring solid with a characteristic composition, crystalline atomic structure, and distinct physical properties. Minerals can be pure elements or complex chemical compounds. mineral acid – A mineral acid is any inorganic acid. Examples: Hydrochloric acid, nitric acid, sulfuric acid, phosphoric acid, boric acid, and hydrofluoric acid are all mineral acids. miscible – Miscible means soluble, able to be mixed and form a solution. Alcohol and water are miscible. mixture – A mixture is two or more substances which have been combined such that each substance retains its own chemical identity. Example: Flour and sugar may be combined to form a mixture. moderator – A moderator is a material that slows the speed of neutrons. Moderators are used in nuclear reactors to slow the neutrons enough to increase the likelihood of interaction with another nucleus to initiate fission. Examples: Water, graphite and heavy water are all commonly used moderators in nuclear reactors. moiety – Moiety is a specific group of atoms within a molecule that is responsible for characteristic chemical reactions of that molecule. molality – Molality is a unit of concentration, defined to be equal to the number of moles of solute divided by the number of kilograms of solvent. Example: The solution made by dissolving 0.10 mol of KNO3 into 200 g of H2O would be 0.50 molal in KNO3 (0.50 m KNO3). molar – Molar refers to the unit of concentration molarity, which is equal to the number of moles per liter of a solution. Molar also refers to other measurements dealing with moles such as molar mass, molar heat capacity, and molar volume. Examples: A 6 molar (6 M) solution of H2SO4 refers to a solution with six moles of sulfuric acid per liter of solution. molar enthalpy of formation – The molar enthalpy of formation is the total amount of energy resulting from the formation of one mole of a substance at constant pressure. molar enthalpy of fusion – Molar enthalpy of fusion is the amount of energy needed to change one mole of a substance from the solid phase to the liquid phase at constant temperature and pressure. molar enthalpy of vaporization – Molar enthalpy of vaporization is the amount of energy needed to change one mole of a substance from the liquid phase to the gas phase at constant temperature and pressure. molarity – Molarity is a concentration unit, defined to be the number of moles of solute divided by the number of liters of solution. 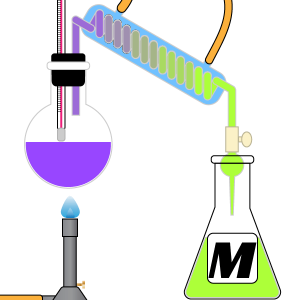 Molarity concentrations are denoted by the symbol M.
molar mass – Molar mass is the mass of one mole of a substance, usually expressed in grams or kilograms. The symbol for grams molar mass is GMM and the symbol for kilogram molar mass is KMM. molar heat capacity – Molar specific heat capacity is the amount of heat energy required to raise the temperature of 1 mole of a substance. In SI units, molar heat capacity (symbol: cn) is the amount of heat in joules required to raise 1 mole of a substance 1 Kelvin. Examples: Water has a molar specific heat capacity of 75.32 J/mol·K. Copper has a molar specific heat capacity of 24.78 J/mol·K. molar volume – Molar volume is the volume of one mole of a substance. Example: The molar volume of an ideal gas at STP is 22.4 L/mol. mole – The mole is a chemical mass unit, defined to be 6.022 x 1023 molecules, atoms, or some other collection of things. The mass of a mole is the gram formula mass of a substance. Examples: 1 mole of NH3 has 6.022 x 1023 molecules and weighs about 17 grams. 1 mole of copper has 6.022 x 1023 atoms and weighs about 63.54 grams. molecular equation – A molecular equation is a balanced chemical equation where the ionic compounds are expressed as molecules instead of component ions. Example: KNO3(aq) + HCl(aq) → KCl(aq) + HNO3(aq) is an example of a molecular formula. molecular formula – Molecular formula is an expression which states the number and type of atoms present in a molecule of a substance. The formula is expressed by the atom’s symbol followed by a subscript of the number of those atoms in the molecule. Typically, the order of atoms is cation then anion. molecular geometry – The molecular geometry describes the shape of a molecule and the relative position of the atomic nuclei of a molecule. molecularity – Molecularity is the number of molecules involved in a single step of a chemical reaction. molecular mass – A number equal to the sum of the atomic masses of the atoms in a molecule. The molecular mass gives the mass of a molecule relative to that of the 12C atom, which is taken to have a mass of 12. Example: The molecular mass of C2H6 is approximately 30 or [(2 x 12) + (6 x 1)]. Therefore the molecule is about 2.5 times as heavy as the 12C atom or about the same mass as the NO molecule with a molecular mass of 30 or (14+16). molecular orbital – A molecular orbital is an orbital or wavefunction of a molecule’s electron. Electrons around a molecule can be associated with more than one atom and are often expressed as a combination of atomic orbitals. molecular sieve – A molecular sieve is a material with very small holes of precise and uniform size. These holes are small enough to block large molecules and allow small molecules to pass. Many molecular sieves are used as desiccants. Examples: Activated charcoal and silica gels are molecular sieves. molecular weight – Molecular weight is a measure of the sum of the atomic weights of all the atoms in a molecule. Molecular weight is often used interchangeably with molecular mass in chemistry, but there is a difference between the two. Molecular mass is a measure of mass and molecular weight is a measure of force acting on the molecular mass. molecule – A molecule refers to two or more atoms which have chemically combined to form a single species. mole fraction – A mole fraction is a unit of concentration, defined to be equal to the number of moles of a component divided by the total number of moles of a solution. Examples: In a solution of 1 mol benzene, 2 mol carbon tetrachloride, and 7 mol acetone, the mole fraction of the acetone is 0.7 (7 of the 10 moles is acetone). mole ratio – A mole ratio is a ratio between the amounts in moles of any two compounds involved in a chemical reaction. Mole ratios are used as conversion factors between products and reactants in many chemistry problems. The mole ratio between O2 and H2O is 1:2. For every 1 mole of O2 used, 2 moles of H2O are formed. The mole ratio between H2 and H2O is 1:1. For every two moles of H2 used, 2 moles of H2O is formed. molybdenum – Molybdenum is the name for the transition metal element with atomic number 42 and is represented by the symbol Mo. monatomic ion – A monatomic ion is an ion formed from a single atom. Example: KCl dissociates in water into K+ and Cl– ions. Both of these ions are monatomic ions. AgNO3 dissociates in water into Ag+ and NO3– in water. Only the silver ion is monatomic. The nitrate ion is called a polyatomic ion. monochromatic – Monochromatic refers to the energy of a single wavelength or frequency. Example: The helium-neon laser has monochromatic output consisting of red light with a wavelength of 633 nm. monodentate – Monodentate refers to a coordination complex with only one point where a ligand can attach itself to a central atom. Example: The hydroxide ion, OH–, is a monodentate ligand because it can attach itself to a central atom only by the oxygen atom. monomer – A monomer is a molecule that forms the basic unit for polymers. Monomers may bind to other monomers to form a repeating chain molecule. Examples: glucose, vinyl chloride, amino acids are all monomers. monoprotic acid – A monoprotic acid is an acid that donates only one proton or hydrogen atom per molecule to an aqueous solution. Examples: Hydrochloric acid (HCl) and nitric acid (HNO3) are both monoprotic acids. monosaccharide – A monosaccharide is a carbohydrate that cannot be reduced by hydrolysis into another simple sugar. Examples: Fructose, cellulose, and sucrose are monosaccharides. moscovium – Moscovium is the name of the basic metal element with atomic number 115 and represented by the symbol Mc. The name moscovium was adopted and replaced the placeholder name of ununpentium in 2016.
mother liquor – Mother liquor is a deprecated term from older chemistry texts that refer to the solution that remains after crystallization occurs and the crystals are removed. MSDS – MSDS is an acronym for Material Safety Data Sheet. An MSDS is a written document that outlines information and procedures for handling and working with chemicals. Current MSDS documents contain physical and chemical property information, potential hazard information, emergency procedures, and manufacturer contact information. MSG – MSG refers to the molecule monosodium glutamate (C5H8NO4Na). MSG is used as a food additive to enhance flavor. multiple bond – A multiple bond is a bond where two or more electron pairs are shared between two atoms. Double and triple bonds are multiple bonds. muriatic acid – Muriatic acid is a general name for a solution of hydrochloric acid or HCl.